In the last 60 years almost every corner of the globe has seen major demographic changes, like population increase and urbanization, in hand with rapid economic development. These processes have played a major role in changing traditional lifestyles; a vivid example being the sweeping shift towards diets richer in meat and animal products. This adoption of protein-rich and energy-dense eating habits has been branded as diet Westernization and is occurring throughout the world. Such change in food habits has resulted not just in massive increases in livestock production globally, but has also contributed to an “obesity epidemic”, as discussed in this recent Our World article on the topic. The Food and Agricultural Organization of the United Nations (FAO) reports that since 1961, the production and consumption of every major meat category has increased significantly. 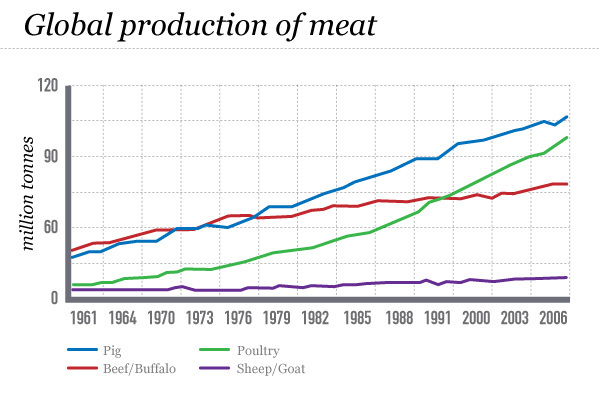 In particular, the production of beef, sheep and goat meat has more than doubled, while the production of pork and poultry increased by a factor of three and a factor of nine respectively, as shown in this graph. This increase of livestock production has been possible through two parallel processes: expansion and intensification. In several areas, livestock production has radically transformed into what is now called an industrialized livestock production system. Such industrialised modes of production tend to be spatially concentrated and geographically detached from the agricultural land base. Livestock activities in the past were mainly located close to pasture and areas where feed crops were grown. However, the overreliance on feed that is part of current production practice means that livestock can now be produced almost anywhere if the logistics allow feed to be brought in cheaply and efficiently. A classic example is the large increase in beef production in the Kanto area (in which Tokyo is located) as discussed later in this piece. Commonly these operations are called Concentrated Animal Feeding Operations (CAFOs). As a new book, The CAFO Reader: The Tragedy of Industrial Animal Factories and numerous scientific reports clearly show, the industrial livestock sector is considered to be one of the main drivers of ecosystem degradation around the world. An influential report, aptly titled Livestock’s long shadow, that assessed the environmental impact of meat production was published in 2006 by the FAO. The report’s findings, though they have attracted controversy, are mindboggling. It is for livestock activities that humankind is currently using the largest area of terra firma — almost 30% of the planet’s land surface. At the same time, these activities are a significant agent of deforestation, with 70% of the previously forested (and now deforested) areas in the Amazon occupied by pasture and livestock feed-crop cultivation (mainly soybeans). The deforested area that is now occupied by livestock related activities is roughly 1.3 times the size of Japan (which is roughly equivalent to the size of Spain/Thailand and double the size of the UK). Given its sizeable impact on natural habitats all over the world, livestock production is also a major driver of biodiversity loss. For example, 23 of the 35 biodiversity hotspots identified by Conservation International are under pressure from livestock production. The report also found that the livestock sector consumes 8% of all water used for human activity and is responsible for emitting a massive 18% of all anthropogenic greenhouse gases, more than all transport activities combined. The two regions in which the phenomenon of diet Westernization is perhaps most widely manifested are South-East Asia and East Asia. Japan is the nation that has likely experienced the most dramatic shifts in the dietary preferences of its citizens during the past decades. This is due to a mixed bag of factors — with urbanization, rising incomes, changes in food supply chains (e.g., increases in the number of supermarkets and convenience stores) and trade liberalization all contributing to the Westernization of diet. A testament to this really momentous change in diet is that residents of Japan’s capital Tokyo are, for the first time in history, consuming more meat than seafood. While the average Tokyoite in 1947 was consuming a modest 5 grams of meat per day, while recent data shows that he or she is savouring almost 90 grams of meat daily. In fact, between 1970 and 2005, the total amount of beef consumed within the city increased by about 160% (equal to 11.5kg per person in 2005) and 90% for pork (equal to 20.1kg per person in 2005) according to calculations for our recent study. 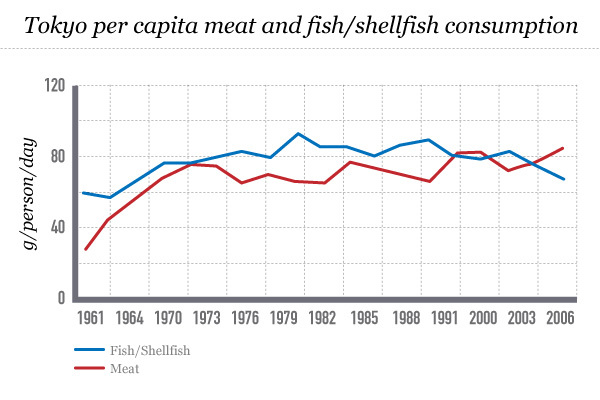 This popularity of a more meat-centred diet and the corresponding decline in rice and fish consumption has resulted in major changes of the average Japanese menu, as detailed in a government illustration shown in the slideshow gallery at the top of this page. 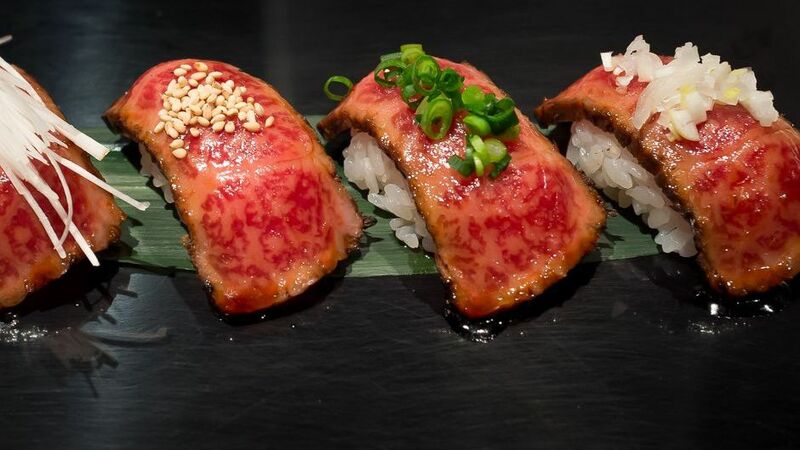 The radical change in Japanese menus towards greater levels of meat consumption can also be easily illustrated through the rising popularity of grilled meat restaurants (yakiniku) and fast food chains. In fact, the expansion of fast food restaurant culture is not to be underestimated considering that Japan currently hosts the second largest number of McDonalds restaurants in the world, with several located in the greater Tokyo area. The skyrocketing increase in meat demand has also taken a severe toll on the ability of the Japanese agricultural system to provide the food consumed within the country. While in the early 1960s the country was almost self-sufficient in beef, pork and chicken, currently Japan is a net importer of every major meat category and of feed, according to FAO statistics. For example, as the above graph illustrates, populous Japan now imports more than 50% of its beef, while it also imports the bulk of the feed used for its domestic beef production. This situation is placing a huge additional direct stress not only on countries that are directly exporting beef to Japan (e.g., Australia, United States) but also to feed producing/exporting countries such as Brazil. Low self-sufficiency in these increasingly popular components of the Japanese diet has been a major headache for the Japanese government. In fact, food self-sufficiency is featured as a top policy objective and the Japanese government is attempting to implement policies that aim to boost food self-sufficiency above the relatively low rate of 40% (compared to other developed countries). One of the most interesting measures adopted is a campaign that promotes a rice-centred diet by praising its health benefits. This whole campaign has been promoted by the Food Education Law (Shokuiku) that makes food education and responsible choice of food a central element of the government’s plans. The proposed intake of food under the Shokuiku scheme is shown in an illustration included in the slideshow gallery at the top of this page. Here, it is interesting to note that the consumption of agricultural commodities such as rice and vegetables, for which Japan does have a high self-sufficiency ratio, are quite prominent when compared to meat, eggs and milk. Apart from its impact on food self-sufficiency, increased meat consumption has another equally serious negative angle, this time linked to the environment. Currently, the meat domestically raised in Japan and consumed in Tokyo requires a vast amount of farmland that is about half the size of the city itself. Even though the actual amount of farmland required within Japan to raise the domestic meat consumed in Tokyo has actually declined (roughly two Tokyos were required in 1970), that has been only possible through the extreme intensification of livestock production. The number of animals raised per hectare of farmland in Japan has increased by a factor of three for beef and a factor of almost ten for pork between 1970 and 2005, our calculations determined. The increase in the Kanto area where Tokyo is situated has been even more dramatic. We found that in 2005, almost 20 cattle were raised per hectare of farmland in the Kanto area (up from 2.5 in 1970) and 538 pigs per hectare of farm land (up from 30 in 1970) suggesting that the Kanto area has indeed some of the most intensified livestock production systems in the country. However, it should be noted that much more land would be needed if the calculation included the land used domestically to grow feed — not to mention the land required in other parts of the world — necessary to providing all the meat consumed in the city. In 2007, an interdisciplinary group led by Prof. James Galloway of the University of Virginia, in a paper entitled International Trade in Meat — the Tip of the Pork Chop, calculated that the land appropriated outside Japan for producing pork and chicken is almost 10 times greater than the land appropriated within the country itself. The most important point here is that those responsible for importing most of the meat, Japanese diners, are not the ones facing the environmental costs associated with their dietary choices. Therefore, Japan’s changing diets and the associated food self-sufficiency challenge is not only critical for Japan but also for countries like Australia, Brazil and the United States that are shouldering the environmental burden of supplying directly and indirectly the country’s growing appetite for meat. Tokyo Drifts from Seafood to Meat Eating by Alexandros Gasparatos and Tatiana Gadda is licensed under a Creative Commons Attribution-NonCommercial-ShareAlike 3.0 Unported License. Tatiana Gadda holds an MSc in Spatial Planning from KTH in Sweden and a first degree in Architecture and Urban Planning from Pontifícia Universidade Católica do Paraná in Brazil. She received her PhD in Earth and Human Environmental Science from Chiba University, Japan. While pursuing her PhD she was also a Cooperative Researcher at the International Development and Regional Planning Unit at the University of Tokyo. In 2006, she joined the UNU Institute of Advanced Studies (UNU-IAS) as a Japan Society for the Promotion of Science-UNU postdoctoral fellow and resumed a position as Visiting Researcher at the University of Tokyo. Tatiana is currently an Adjunct Professor at the Universidade Tecnológica Federal do Paraná in Brazil. Her current research focuses on urban consumption patterns in cities with different income levels. Most countries would probably be much more self-sufficient if they start a vegetarian based live style. But that would require a mind shift in global consciousness. Noticed that this article got the stats from faostat and I tried to find the data but didnt find it? 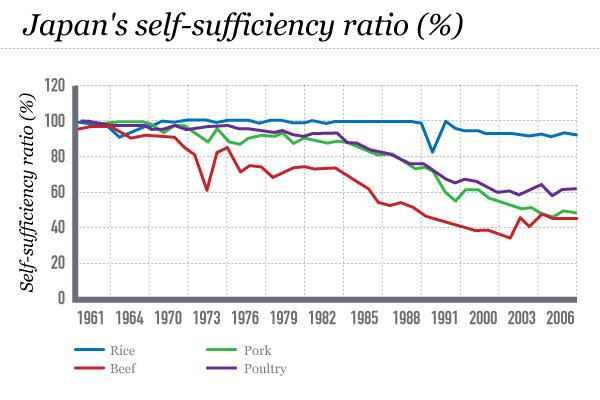 Would love to see the self-sufficiency% of a lot of countries from FAO-stat but only find like total production etc :(. Carl Heintz: you just need to take the two series: total production and total domestic supply from FAOSTAT Commodity Balance and then take the ratio of the two.